Amongst all the nonsense about Andre Villas-Boas being the new Jose Mourinho, the irony is that he’s done more to move Chelsea away from Mourinho’s overall playing style than Avram Grant, Felipe Scolari, Guus Hiddink and Carlo Ancelotti. In particular, the way they play without the ball. Though not as much of a purely defensive manager as often made out, Mourinho was a fan of defending deep at Chelsea. The 4-3-3 looked more like a 4-5-1 in the defensive stage, with players asked to get behind the ball quickly and retreat into a deep, compact unit. This idea was more or less continued by his successors – Hiddink was a little more attack-minded but in the biggest games (notably against Barcelona) Chelsea were Mourinho-esque, whilst Ancelotti’s Chelsea were often rampant with the ball, but sat very deep without it – Florent Malouda and Nicolas Anelka were asked to move back and become wide midfielders. Villas-Boas is different. His Porto side featured heavy pressing and a much more proactive strategy when it comes to winning the ball back. In this respect, he shares much more in common with Pep Guardiola (a man he hugely admires) than Mourinho. ecause pressing can result in various outcomes – interceptions won, tackles won, opposition passes misplaced, it’s difficult to come up with an individual statistic that answers the question – are Chelsea pressing more this season? A decent place to start, though, is offside figures. Because pressing involves closing down high up, and because any side (regardless of whether they defend high or deep) has to stay compact to prevent being played through between the lines, a high defensive line is a natural consequence of pressing. Chelsea have notably struggled with this at some points – the home game against Norwich in particular, where Grant Holt kept getting in behind the defence. But they’re still playing high up, trying to catch the opposition offside. As a result, a comparison of their nine games so far this season and their first nine games of last season indicates a significant increase in the number of times the opposition are caught offside. An average of 4.33, up from 1.67; that’s an increase of 160%. This doesn’t prove that Chelsea are pressing more, but it does indicate that their defence is playing higher up the pitch – and there’s a clear link between those two concepts. One of the drawbacks with pressing is discipline. Your forwards are closing down and making more tackles, your midfielders are doing the same and sometimes forced into ‘cynical’ fouls to prevent the opposition breaking, and the defenders are leaving space in behind, making them prone to being sent off for denying clear goalscoring opportunities, as happened with Jose Bosingwa at the weekend (when, incidentally, Villas-Boas coped very well when down to nine men, as David Pleat articulates). An obvious example of this is the Chilean side at last summer’s World Cup. They pressed more than any other side, but ended with more bookings than any other team in the tournament (with the exception of Holland, who played two games more and racked up most of their bookings in the final). They had two players suspended for the Spain match, an three from the Brazil match, and averaged 3.4 bookings per game, compared to the tournament average of 2.04. On the other hand, the side that defended the deepest, the North Koreans (with their odd five/six-man defence), picked up the fewest bookings in the tournament, just two from three games. As for Chelsea, they are indeed conceding more free-kicks than in the equivalent spell last season. An average of 12.8, up from 9.1 – an increase of 40%. And that’s not all – Chelsea aren’t just conceding more fouls than last year, they’re picking up more bookings than any other Premier League side, even if a large number came on one game, against QPR. That’s quite a turnaround from last season, when they were given an award for having the best disciplinary record in the league. The bookings can be linked to a more proactive approach without the ball, as can all three red cards they’ve suffered this season. Bosingwa, as mentioned, fouled when he was the final defender forced to cover a lot space in behind. Didier Drogba and Fernando Torres got red cards for terrible tackles in the opposition half, but would they have been making those fouls last year? Probably not – they’ve been told to close down and help defend high up the pitch, rather than just dropping back and forming part of a deep barrier that opponents can’t break down. Both tackles were more about a lack of tackling technique than pure dirtiness. 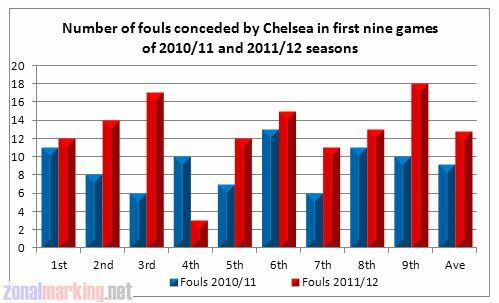 Are Chelsea conceding fewer shots? From 12.7 to 10.1 per match, a 21% decrease. And, more than that, they’re conceding fewer shots than any other side in the league. They may not have a particularly good record at keeping clean sheets, but if Manchester United’s tendency to concede a lot of shots hinted at a heavy defeat, Chelsea’s tendency to concede few hints at an upcoming decent run defensively. 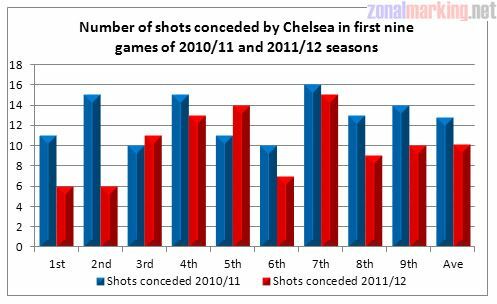 This doesn’t take account of the type of shots Chelsea are conceding, and their record of conceding the least number of shots can also be attributed to having the highest average percentage of possession so far. A deep defence is likely to concede lots of shots but a high proportion of them will be long-range efforts, whilst a higher defence is more prone to one-on-ones, which are naturally very good goalscoring opportunities. As mentioned earlier, this is a particular problem for Chelsea at the moment. This will be of interest against Arsenal this weekend. Arsenal may have their own problems, but if there’s one thing they do have, it’s pace. Theo Walcott and Gervinho can come inside from the flanks to get on the end of balls over the top, whilst Robin van Persie is in good goalscoring form, and is an expert at dragging centre-backs high up the pitch. This will be an interesting test for Villas-Boas – should he continue to press and risk being caught out, or ask his side to defend deeper? I would argue for the former, and I really hope his defenders get caught out by our Arsenal attackers. Great article, however Holland played three more matches than Chile, not two. Will try to look at them too! I understand that maybe mourinhos system before was keeping the defense deep but with real madrid, atleast recently; he has employed the same high line pressuring system. So i would not conclude that Mourinho’s philosophy is deep defending. brilliant post, as always ZM. It’s nearly impossible to measure intensity as it’s an “effort” stat. I would think that distance covered by the forwards as well as ZM’s positional map could give a better sense of what the article is trying to point out. As far as my Blues, folks are right about it not really suiting Terry. Not only does it put him at a disadvantage due to pace but it also encourages split second decisions which JT has been know to lapse at. Luiz is simply not disciplined enough to trust in the backline. I would be in favor of transitioning him into Mikel’s role as he’s much better on the ball, has better pace (see UCL match vs Inter when Milito outpaced him), has a ball-winning mentality, and is full-out 100% effort. Personally I love the tactical & mental changes being brought out by AVB. It was a little painful early on but the squad keeps improving despite the bookings piling up. It is very much possible, but not sure it is readily available for free – companies like ProZone, Opta, etc track all this info, but subscriptions are (I imagine) very expensive for a non-professional user. I think terry has suffered from this more than others. He doesnt have the pace to play in a high line, so chelsea are gonna be very susceptible to balls over the top, which arsenal thrive in. It will interesting to see how walcott does on terrys side. I dont think ivanovic is very good in a high line either, he lacks pace and is slow in the turn. David Luiz is the only one that does look comfortable, as he likes coming up the pitch and has the pace to keep up with strikers/wingers. But the rest of the team looks much better for pressing, and chelsea are playing some really good football. I cant see them winning the league, but they will be top four and will play some entertaining stuff (the new arsenal??). I also dont think there strategy is good for the champions league, and I can see them getting knocked out by a lesser team. Not only does Terry lacks pace to play the high line but also Petr Cech is not well-suited to the pressing style that Villas-Boas is trying to implement. At Barcelona, Victor Valdes is very quick and mobile and is able to cover for his centre-backs when high balls are hit over their heads. Petr Cech doesn’t look as comfortable when he has to sprint 20 yards to kick the ball out and likes to stay closer to goal. By no means am I saying that Petr Cech is a bad goalie. On the contrary, I think he is one of the best in the world. However, his style is not well suited to what Villas-Boas like to implement. Couple this with the fact that Terry lacks pace, I think other teams will try to exploit the space between Cech and Terry. I think Chelsea, or more specifically Terry, will concede some goals like the ones scored by Germany against England. I totally disagree about Cech. He’s certainly not a sweeper-keeper like Valdes, but his distribution is amazing–he had several assists during the 2009-10 Double season in which he smashed the ball directly to Drogba, and started plenty of immediate counter-attacks. Furthermore, during a match this season, Cech caught a ball, fell on it, and tossed it from his side to begin a counter-attack. His distribution has always been excellent; I’d say AVB has had an even more vital impact on him since he’s always looking to throw forward. Maybe a reason why United are conceding so many shots (especially from distance). There is too big a gap between the defence and midfield? With an ever-changing back four, the line isn’t being marshalled properly? Anyway, I thought Chelsea dealt very well with QPR, even though they only had 9 men. Poor tackle from Drogba and Boswinga (cheers Jamie), Villas-Boas will need to work on his system with his players to get it nailed down, but it certainly makes for a more entertaining side to watch. I’d imagine that is the case, Pub. And it should hardly be surprising when you consider that the central midfield has been occupied by the likes of Anderson, Cleverley and Fletcher (the first two very different to the latter in style but all have a tendency to carry the ball forward rather than guard a position). When it comes to the back line, neither are Vidic and (an ageing) Ferdinand comfortable pushing up to compact the space vacated by United’s midfielders. Great article! Please write more articles on the more complex issues with tactics. I love the thoughts on how formations can be very different depending on tactical ambitions, the kinds of players required for them etc etc. It would be interesting to read a similar article on Arsenal, especially ahead of the game this weekend. It would also be interesting to muse around what kind of reinforcements Chelsea would look for in the short and long term, given that Villas-Boas will try do create a Barcelona-esque team and philosophy. Consider the request for a corresponding look at Arsenal before the upcoming London derby. I feel like the “who should they buy” kind of thing is best left to goal.com and the tabloids. Compare heat maps of the 2 centre-backs from this year to last against similar opposition with similar match results perhaps? On the non-tactical front: the problem of reconciling the tactics with Terry may be suspended for a while. If Luiz would stop being so impatient he’d be more useful to his side. That Mata fellow is impressive. I agree with the rest of the article, but isn’t that chalkboard incorrect? Doesn’t it disprove your point? Judging by the arrow in the bottom left, Chelsea are shooting right. Therefore, the two tackles from last season are in the opposition half. Which chalkboard – has it been removed or is it not showing up on mine? 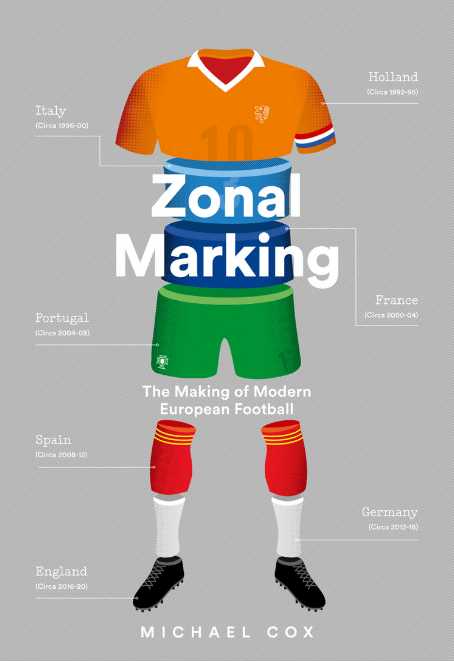 ZM, I think this article will not be complete without referring to Barcelona, the pressing masters. Except for offside master – Villa, they dont have many off sides, nor do they concede many fouls. Nor are they left open at the back very often. And Valdes is the best ball playing goalie now. There are many games when he had as many passes as some of the players in Barca, and in a CL match had even more passes than Zlatan. Add to it, Barca concedes least shot on their goal. My comment, only because, you have referred to Chile here. So definitely it is not like looking within the UK. So. If not, it is definitely a brilliant article. 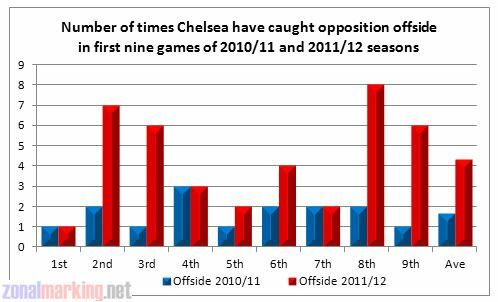 I think by offsides ZM was referring to number of times Chelsea caught opponents offside, not how many times they were offside. Which Barca are really good at too, so it’s still a valid comparison. Barcelona are often caught with their CBs spread miles apart. Look at the goal by AC MIlan in the group stage. I know they didn’t have their normal CBs but Pique and Puyol often end up playing in the RB and LB positions when Barca has the ball. Sometimes Busquetes doesn’t get deep enough leaving the middle wide open. Barcelona are great but their defense isn’t perfect. Right-side is still an area of concern. Bosi’s form dipped after early season games and Sturridge link-up play is mediocre. I enjoy these general analysis posts more than individual match analyses; it gives us more of an insight into elements of the game rather than specific tactical setups/decisions. 1. Have you any interest in writing a book like that/along the lines? I know a few statistics/economics professors who might be interested to crunch data and work for something they are seriously interested in, viz. football. 2. Have any teams come to approach you for any sort of a role; perhaps as a Director of Football role? One of the most intriguing things about football (as opposed to basketball, which was my first love in terms of sports) is the relative lack of firm statistics available for analysis. It really annoys me how the good soccer data collected is often proprietary. There are tons of sites you can go to for in-depth analysis of NBA statistics, but Opta dribbles out soccer stats on twitter like they’re gold dust and keeps all the really good stuff for paying customers. I think this is on the leagues – the NBA keeps and publishes all kinds of official stats, and soccer leagues should emulate this instead of letting for-profit firms act as gatekeepers so that not even some professional teams (I’m thinking of Sid Lowe talking about Levante being too poor to buy prozone or whatever) have access to the good stuff. It’s also on the journalists: general match reports in my opinion are of relatively low quality – often they’re not only relatively uninformative but poorly written and cliche-ridden – when they could be using data to actually describe the dynamics of the game. anyway, what I meant to comment on is that given this situation, the hunt for publicly available proxy measures is an interesting diversion. I though offside incidents, fouls by forwards, and tackle location were interesting measures, and I also liked the suggestions in the comments of CB heat map examination. i agree 100% – journalists are so poor and biased in this country it’s like a bad joke then reading that they are writing – all these qliches, and they supposedly right moral high ground it’s really annoying, but most schocking it’s just how they treat readers – like an village idiots, british media is corrupt and total disgrace, but this site is doing his job, well done. Guardian chalkboards are a pretty great statistical tool. Also whoscored.com is the best free equivalent I’ve found for other leagues (ESP, ITA, GER, FRA). thansk for the suggestion, stats, and good looking out by ZM for adding. Why not use the kilometers run by the footballers and compare them to last year’s? A proactive side runs more than a reactive one, doesn’t it? I think they run the same? No? The proactive team runs towards the goal while the reactive team runs BACK to their goal, that’s my logic. Although, if there’s a chart that shows where a player has run within the field then at least you know how much yards has he covered. There was an interesting chalkboard in one of the German sport newspapers last weekend that had one line showing where one player (Mladen Petric, the Croatian Hamburg striker) had run. It was color coded to show his speed, and was to me more informative than looking at a heatmap. Maybe that would show it? Villas-Boas has to be a great example of the Emperor’s new clothes. He’s already talking about how the refs are cheating him out of wins. By that argument, you could say the same about Mourinho. After all, he had ‘only’ won the UEFA Cup and the ‘Mickey Mouse’ Portuguese League, and his Champions League win with Porto was due to a bad offside call against Man Utd and a plum draw in the final (Monaco, of all teams). Why not give Villas Boas some credit? After all, he’s not the only manager who moans about referees! I’m a little confused ZM by reading your articles on Chelsea here and on ESPN. Question: In Villas-Boas’ 4-3-3, does he use a central playmaker in his three man midfield? From what I understand, Mikel/Meireles is a sudo deep lying playmaker/holding midfielder while Ramires is a shuttler and Lampard is an attacking midfielder that gets into the box. My understanding is that the main play maker is Mata on the left wing who comes inside centrally to give himself more options (i.e. passing to Torres, Lampard, Cole and Sturridge). Hope you or someone else can clarify. Thanks! Yep that’s exactly right. Mata comes inside from the wing to be the playmaker, much like Silva for Man City. Great observation – Carlo’s AC Milan side also liked to sit back and wait. VB is very brave to try and implement a high defensive line when Ivanovic, Alex, and Terry are not very fleet-footed (and David Luiz is a bit error prone). 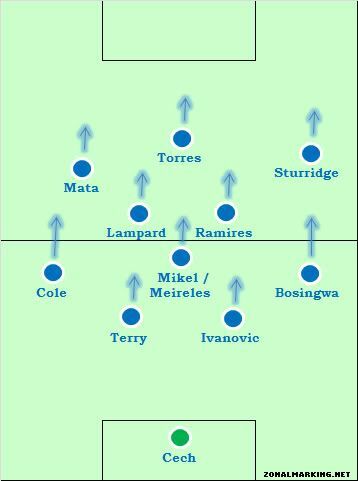 However, with Torres returning to form and Mata starting to impress, plus Meireles and Ramires as options, it makes sense to press both mid-term and long-term. Clearly the players average field position should show whether they are pressing high up or not – I guess this is proprietary? Really I don’t see the need to prove this via Stats – you could just prove it by comparing similar transactions from games against the same team. e.g. Where do the midfielders move to after turning the ball over versus Man U in 2010 vs 2011? I don’t like average position diagrams, too open to too many variables for my liking, and there are also question marks about how they’re calculated. I know its a weird advice but what instead of watching/reading stats you just watch how the teams play?You should be able to tell by watching them play, where their defence is and what is their team doing.No? Well, yes…thanks for that. The point is that statistics and actual evidence can be more useful than me going “I reckon”. Absolutely fantastic article. The way the statistics are put together and the argument articulated is just brilliant. I’m especially happy to see Villas-Boas’ similarity to Pep Guardiola mentioned – the Mourinho comparisons are getting more boring all the time. To be honest, they were always quite lazy. Great articles – I’m learning a lot! I coach youngsters so we don’t spend a lot of time on tactics, so this is where I’m learning a lot of tactical concepts. One point I’d like to make is technical ability and tactical ability are two sides of the same coin. Do you agree? 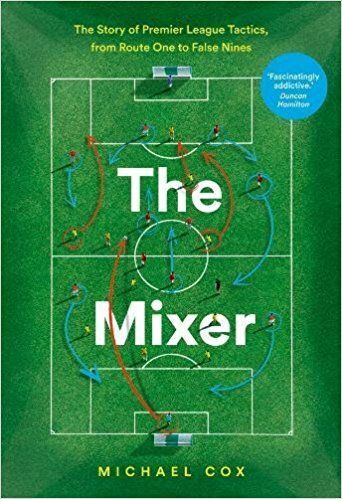 As a coach I harp on about technique constantly and I think the standard-bearers of modern football – the Germans and Spanish – have taken tactical excellence to another level because of their superb technique. I think your quote goes some way to proving this link. I would love to see a piece examining how technique and tactics go hand-in-hand. Great work ZM – keep it up. FINALLY MICHAEL! An article about Pressing! I think the red cards could easily be cut out. Just tell your forwards not to be stupid and leave the tackling to the defenders. Bosingwa’s was unfortunate. They pulled each other down and only he got blamed. Turnbull could do nothing about Saha’s dive. But you also have professional foul red cards. As teams try and hit balls over the top because of your high line. For Chelsea I would have thought that Terry, not by being incredibly slow but just by not being particularly fast, would be vulnerable- as I think someone may have already said. Does having Ivanovic in the centre hinder their progress with possession from back? Anyone noticed? -I only say because I think ZM said he was the only player Man U let have the ball in peace when they played Chelsea and pressed them last season, suggesting he’s not great with it. He’s playing in two different position. Ivan is actually good at passing, more so after AVB arrive. How different would be AVB’s pressing to the “achique” philosophy that Cesar Menotti advanced in the 70’s? Key to AVB’s pressing style is the acquisition of Meireles. He’s not a world beater by any stretch, but what he offers is intelligence on the ball, good movement off of it, pressurization to win back possession further up the pitch, and a clear understanding with Torres and Mata. His positional awareness is top notch, so he serves as the perfect linkage between front and back, and that keeps the play moving forward and allows the back line to move further up. As a Liverpool supporter it was pretty obvious to me that letting him go was a mistake, but in terms of league play and where Chelsea finish, this could well prove to be the buy of the season. Brilliant. I noticed that in most games teams like Barca actually have more fouls than the opposition, even if they have over 70% possession, being dirty and cynical has its advantages. It lets the team get back into position and after most free kicks the defence gains possession. Chelsea do that, though they get called on it more often and get more cards, whereas Barca are allowed to get away with it. Thanks for a very good piece.